Effective plans for Squirrel Proof Bird Feeders use the right Bird Feeder Baffles and Bird Feeder Poles. A squirrel proof bird feeder stops squirrel problems before they begin. Experience can be the best teacher in defeating squirrels. Choose from the excellent squirrel proof bird feeder designs that work. The Squirrel Stoppers category also has examples of our many different solutions! Got to see bird feeders that are Squirrel Proof Bird Feeders now! Got Squirrels? Got squirrel problems? Are nature's tenacious gymnasts frustrating you? Then it is time to use the solutions of our Squirrel Proof Bird Feeder designs below. Squirrels can be fun to watch but not when they are raiding your bird feeders! 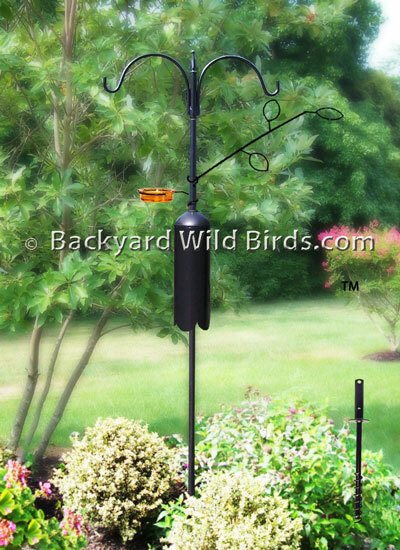 Our Bird Feeder Poles are designs that automatically squirrel proof bird feeders. They prevent squirrel problems by blocking squirrels from climbing up their poles. The three categories below of Squirrel Stopper Pro Poles , Squirrel Proof Poles and Shepherd Staff Poles are different styles that have very effective solutions. 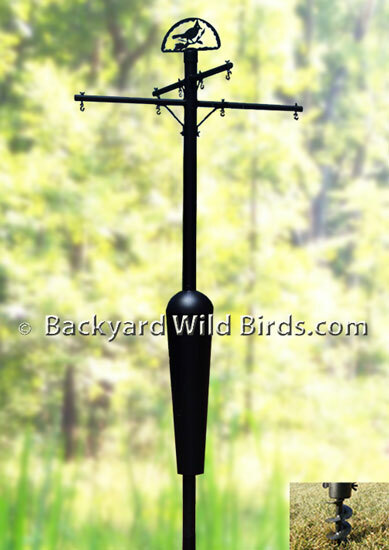 These Bird Feeder Pole Systems each offer many choices and variations to meet your birding needs. 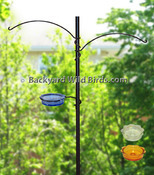 Select which one is just right for your backyard wild birds! 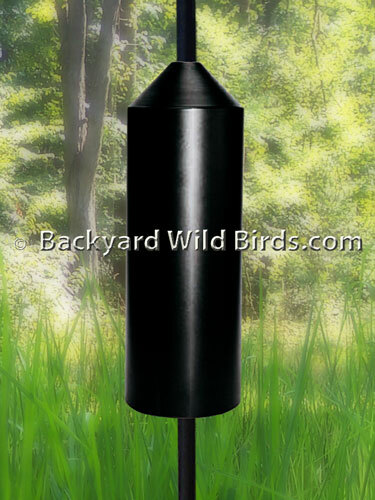 See our Bird Feeder Placement is key section for the right location for your new Bird Feeder Pole. Also, the Bird Feeder Pole Systems category has examples of poles systems with bird feeders already on them. Squirrels are without a doubt a major problem in wild bird feeding. Any bird feeders placed on a squirrel proof bird feeder pole are squirrel proofed by the pole. A bird feeder hung on a tree or suspended wire can also be made squirrel proof with the right design and location. 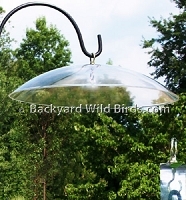 These Squirrel Proof Bird Feeders below use effective squirrel baffles above them or caged bird feeders. 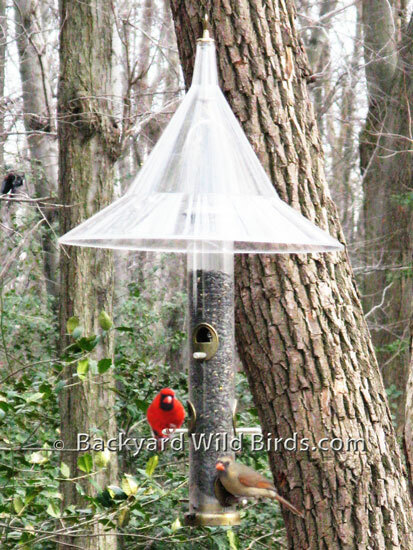 The first two examples show plastic Hanging Squirrel Baffles above their feeders and the caged bird feeder has wire grid to block squirrels while allowing songbirds access. They show that the best squirrel stopper defense is a good offense. Other recommended Squirrel Baffles can be added to existing Bird Feeders to achieve squirrel proof bird feeders. 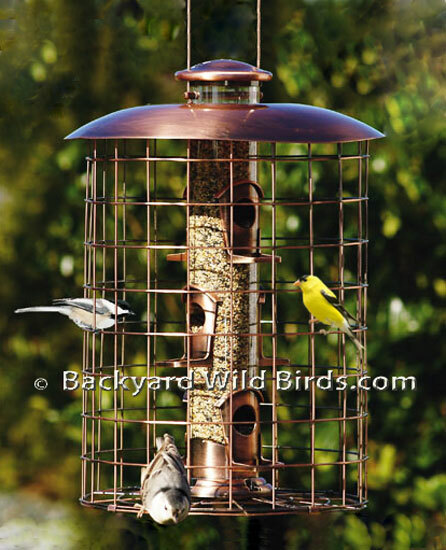 With the right mounting and placement you can enjoy feeding wild birds and not the squirrels. Bird Feeder Baffles are categorized by their size and function. Bird Feeder Squirrel Baffles such as the clear 20" dia. 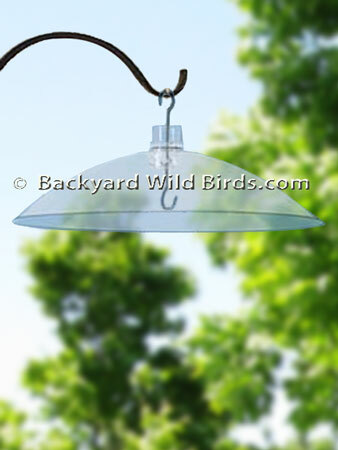 baffle are a device large enough to block squirrels when hung above bird feeders. 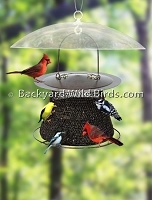 Dome Hanging Baffles are a smaller bird feeder weather guard that gives protection from rain and snow. If bird seed stays wet, it can then become fouled. Birds instinctively will not eat it in this condition. Weather Guards have an added benefit of not only allowing birds to feed in all weather, but all year round! The Larger 20" Squirrel Baffles when placed in trees as hanging feeder mounts defend against both squirrels from above and weather at the same time. Pole Squirrel Baffles block squirrels from climbing a pole and protect the bird feeders that are hung above them. Need Squirrel Stopping Solutions? See examples of the best in class Squirrel Stoppers here. There are two main mounting methods to have squirrel proof bird feeders: Figure 1 - Squirrel Proof Bird Feeder Pole Mount (with defense from below) and Figure 2 - Squirrel Proof Bird Feeder Hanging Mount (with defense from above). 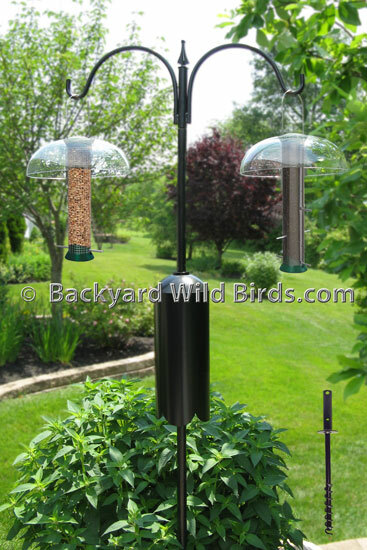 Bird feeder 'Pole Mounts' have the advantage of being able to be placed almost anywhere (usually in an existing or newly made flower bed). With bird feeder 'Hanging Mounts' you are limited to a good tree with available useful branches or a suspended wire across a clear section. Use the Right Squirrel Baffle! Above are pictures showing Bird Feeder Baffles for these two mounting methods. 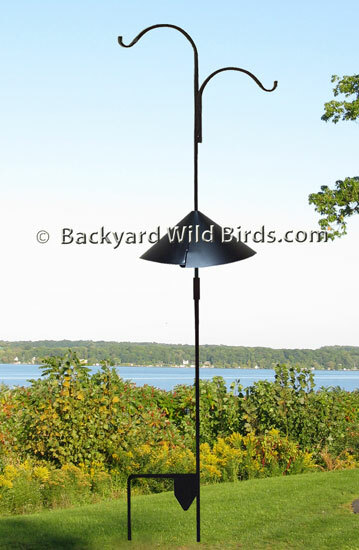 Figure 1 - Squirrel Proof Pole Mount is Bird Feeder Pole System B1 with a black Cylinder Squirrel Baffle mount approximately 4-5 ft from the ground and blocks squirrels from climbing up the 1" pole to the feeders. Note: The clear 18" diameter Tube Bird Feeder Baffle weather dome shown above can be used as a stand alone hanging squirrel baffle. Figure 2 - Squirrel Proof Hanging Mount is shown with a 17" diameter clear dome Squirrel Proof hanging bird feeder Sky Cafe with a steep slope. Domes with a more gradual slope should be at least 18" to 22" in diameter to be recommended as an effective squirrel baffle. Bird Feeder Placement is key! 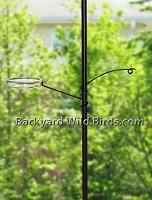 Bird feeder and bird feeder pole placement is critical in having a Squirrel Proof Bird Feeder. Both placements should be a mimimum of 8 - 10 ft (12 ft if have room) away from any object a squirrel can launch a "sideways" jump from. These jump points include a tree trunk, tree branch, wall, fence, stiff bush, rock, bird bath, etc. If you have a hanging bird feeder that is hung from a branch, choose a branch that does not have a lower adjacent branch. A good choice is one that is 8-10 ft high that can have a 2-3 ft hanging wire attached. The goal is to position the bottom of the bird feeder around 5-6 ft off of the ground. Follow these guidelines and successfully create your own Backyard Wild Birds habitat with squirrel proof bird feeders! Choose the method that will serve your purposes from the very best Squirrel Stoppers .